On the 23rd August 2014, Well Fit Gym in Rathfriland organised a day in which friends and family would come together and take their dogs on a ‘Paws For Thought Mourne Challenge’ up to the peak of Slieve Donard. Organised by Eilionior Fegan, everybody got together for a morning and donated to take part in the event for our charity. PIPS Newry and Mourne would like to give a special thanks to Eilionior Fegan, all the staff at Well Fit and to all the people who took part in a great active event, we are delighted to have received £185 from the ‘Paws For Thought’ dog walk up to Donard. Thank-you for all the fundraising efforts you all have put in. 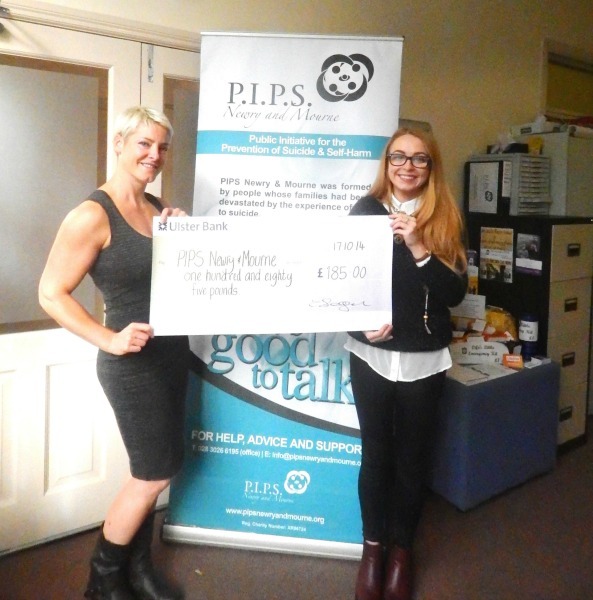 Below is Eilionior presenting a cheque of £185 to PIPS N&M Amy Henshaw.